Ski in Ski out luxury condo at Aspen Mountain. This second level 2-bedroom, 2-bath deluxe townhouse features ski-in, ski-out access to historic Lift 1A on Aspen Mountain, and is only a short walk to downtown Aspen.Enjoy breathtaking views of the town of Aspen, Red Mountain and Smuggler Mountain! This unit features a gas fireplace in the main living area, granite counter tops in the kitchen and both bathrooms, and a washer/dryer. 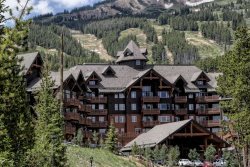 Complex amenities at Shadow Mountain include ski-in, ski-out accessibility; a heated outdoor pool kept at Jacuzzi temperatures during the winter; complimentary Aspen airport transfers; on-site free parking; and free Wi-Fi. Shadow Mountain also has a recently upgraded tram system that provides easy access to all levels at the complex.